Rising energy costs have not only, homeowners but business owners in Cleveland and Northeast Ohio looking for creative solutions to reduce energy costs. Environmental regulations and concerns about their employee’s health also have businesses, consumers and government agencies looking for energy strategies that will not only save money, but will add business value into the future. With electrical costs accounting for more than 25 percent of the energy used in most facilities, it makes sense that property owners are extremely excited about the development of LED lighting in Cleveland and Northeast has the ability to utilize new technology that will significantly lower their energy costs while reducing the presence of hazardous gasses, such as mercury, in their work environments! Immediate Energy Cost Savings. There are other alternative energy initiatives on the horizon, such as solar power. None compares with LED lights ability to yield significant immediate cost savings. Once LED lights are in use the positive payback period is averaged in 2-4 years compared to 20+ years with solar energy! Maintenance Cost Minimized. LED lights are “all the buzz” because of the longevity that they are able to provide. Compare a standard fluorescent bulb which has a 10,000 hour rating and a LED light which has a 50,000 hour rating. You can run a LED light bulb for 8/hours per day for over 16 years before having to change it! Benefits the Environment. Florescent lights operate by electronically charging gasses within a tube to create illumination. One of the gasses used in this process is mercury, which is poisonous to humans and harmful to the environment. Florescent bulbs pose a serious threat to the environment due to the difficulty posed in recycling. They leak their contents into the environment through landfills and water sources. LED lights have eliminated this harmful threat to the environment as they are ROHS certified and contain no mercury! Taking advantage of these energy saving measures do not have to be complex or time consuming. 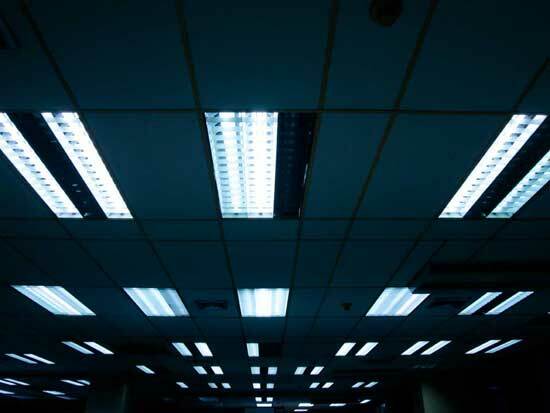 At Portman Electric, Inc. one of our industrial licensed professional electricians can easily show you how LED retrofitting your traditional light fixtures can allow you to quickly harness all the benefits of LED. Lighting retrofits improve the quality of lighting but also reduces HVAC run times because less heat is produced by LED lighting. 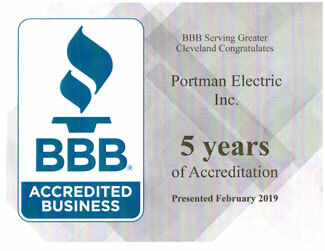 Our electrician will show you how a lighting retrofit will make your buildings lighting for Cleveland and Northeast Ohio clients more efficient over time and how the energy savings will be significant enough to not only pay for the cost of the equipment but produce a return on your investment!